HomeBank is introduced here. It is a public, permanent, extensible, online database of daylong audio recorded in naturalistic environments. HomeBank serves two primary purposes. First, it is a repository for raw audio and associated files: one database requires special permissions, and another redacted database allows unrestricted public access. Associated files include metadata such as participant demographics and clinical diagnostics, automated annotations, and human-generated transcriptions and annotations. Many recordings use the child-perspective LENA recorders (LENA Research Foundation, Boulder, Colorado, United States), but various recordings and metadata can be accommodated. The HomeBank database can have both vetted and unvetted recordings, with different levels of accessibility. Additionally, HomeBank is an open repository for processing and analysis tools for HomeBank or similar data sets. 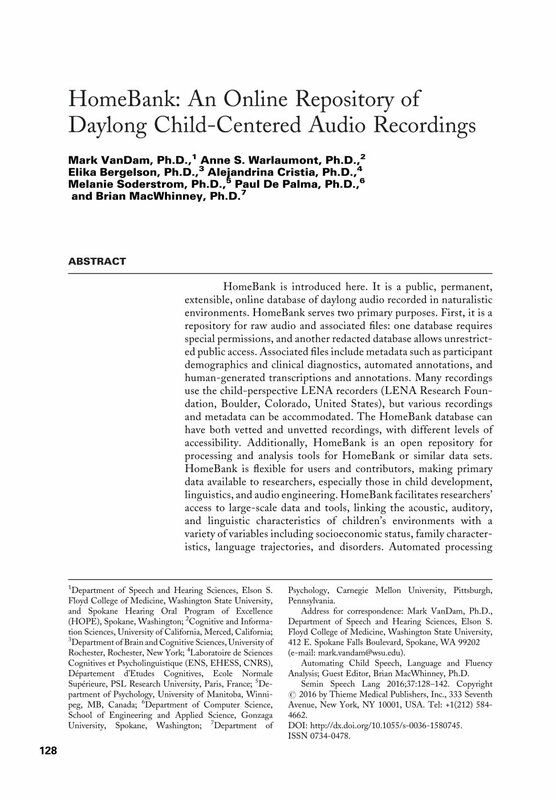 HomeBank is flexible for users and contributors, making primary data available to researchers, especially those in child development, linguistics, and audio engineering. HomeBank facilitates researchers' access to large-scale data and tools, linking the acoustic, auditory, and linguistic characteristics of children's environments with a variety of variables including socioeconomic status, family characteristics, language trajectories, and disorders. Automated processing applied to daylong home audio recordings is now becoming widely used in early intervention initiatives, helping parents to provide richer speech input to at-risk children.